It’s always amazing to look back at the Nintendo 64 and remember the incredible games that came out during the console’s legendary run. Here are the four best N64 games about giving Bernie Mac a haircut that made the system one of the greatest in gaming history. Nintendo created Hair Farmer: Bernie Mac in an attempt to replicate the success they had had with the farming simulator Harvest Moon. Hair Farmer: Bernie Mac placed gamers in charge of a small hair farm on top of Bernie Mac’s head where they had to regularly coat Bernie’s scalp in Rogaine to make his hair grow, shampoo it, comb it, and when it got long enough, cut it off and sell it. There was no moment as frustrating as when the game’s soundtrack suddenly changed to Bernie Mac’s booming voice delivering his Live In Vegas stand-up special and his enormous hands would start pounding his head as part of his delivery, sending your farm and supplies flying. This game was endlessly playable and super addictive. Once your farm on Bernie’s head was prospering, the game put you in charge of hair farms all over the rest of his body. Bernie Mac Haircut Simulator ’98 was the first game on the N64 to simulate the entire Bernie Mac haircutting process, from leading Bernie from the barbershop entrance over to the chair, to making small talk about his 30-year comedy career, to brushing off his neck and handing him a mirror to check out the back of his head. Any N64 owner who owned this title will remember perhaps the game’s most difficult challenge in which Bernie Mac would come into the barbershop on a lunch break in a mad rush to get back to the set of How To Be A Player. Gamers had to give Bernie Mac a haircut in under three minutes as he alternated between chowing down on a Subway six-inch cold-cut combo and falling fast asleep in the barber chair. If Bernie’s haircut wasn’t done right in three minutes, the comedy star would erupt in a fit of rage and players had to try to shoo him out of the barbershop as he toppled supplies onto the floor and threw handfuls of loose hair from off the ground. The game has yet to be matched in terms of straightforward Bernie Mac haircut simulation, and remains a true standout in the N64’s stellar catalog of games. 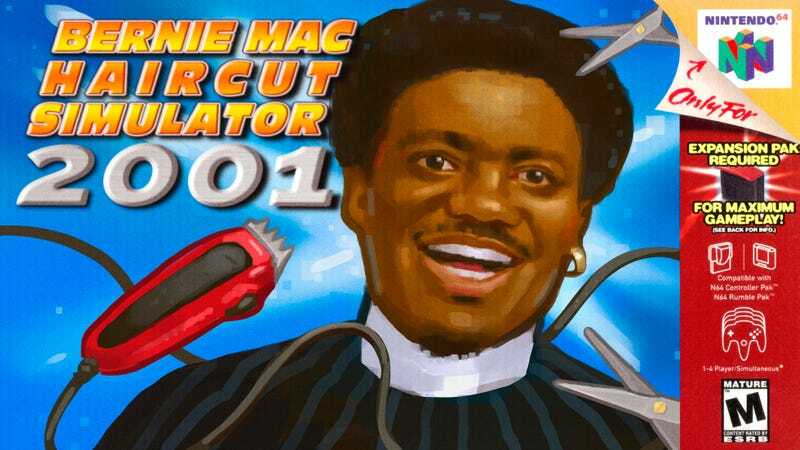 In what many consider to be the most ambitious game about giving Bernie Mac a haircut, Bernie Mac Cuts His Own Hair had players control Bernie Mac’s arms as he cut his own hair while lying down naked in his shower-bath combo. The game was notable for its intense difficulty, and one wrong move could result in Bernie Mac cutting off his own ears or decapitating himself. As the game progressed, Bernie’s wife would knock on the bathroom door asking what he was doing in there and players could select phrases for Bernie Mac to shout back like “I’m making myself look handsome again!” or “Can’t a man ever just cut his own damn hair in peace?” If Bernie Mac took too long to cut his own hair, Bernie Mac’s wife would break the door down and divorce him on the spot. Capcom’s 1999 entry in the Resident Evil franchise had players battling their way through a six-mile-long barbershop where the Umbrella Corporation is holding a sedated Bernie Mac in a back room under an experimental hair-regrowth treatment that causes his hair to grow three feet per minute. Seeing Bernie Mac’s writhing ponytail fill the hallways of the dirty, abandoned barbershop as it lurched at the screen in full 3D graphics was an awesome sight. And the final scene in which you finally reach the chained-up Bernie Mac lying in his signature black pinstripe suit, cut his massive ponytail all the way down to his scalp, and behead him with a rusty pair of scissors is still one of the creepiest visuals in Resident Evil history. Resident Evil: Bernie Mac’s Haunted Ponytail might look a little dated by modern gaming standards, but the gameplay is absolutely unmatched, and if you can track down an old N64, the game is definitely well worth a replay.